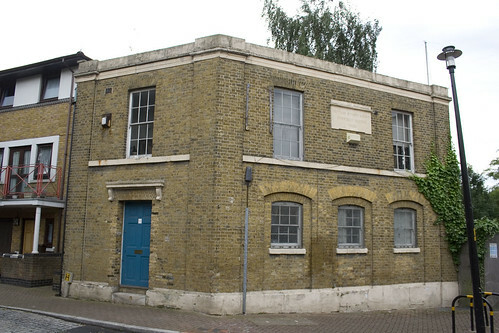 If you were to take a walk along the Thames riverside in Bermondsey, you might come across a slightly run down looking building with an imposing stone plaque on the wall indicating a great heritage. This is an office block from a former sewer pumping station, which has since been demolished, leaving behind just this fragment of its existence. As you might have guessed from the date, the sewers concerned pre-dated the great works of Joseph Bazalgette in the 1860s and were constructed by the Surrey and Kent Commission of Sewers. At the time, this part of London was still part of Surrey, and this particular Commission can be dated to 1554, as its Letters Patent were granted by Bloody Mary following a series of “gret wyndes and fluddes”. Sewers at the time were also more interested in draining water to prevent flooding in the low lying lands, not the removal of human waste. The cost of maintaining the water drains was paid by the land owners, at a rate based on the size of land owned. Most of the sewers managed by the company in the area were below the level of the Thames at high-tide, so they built sluices, with gates at the river edge to help manage the flow of sewage into the river. It is one of these sluice-gates which was on the site next to this remaining building. 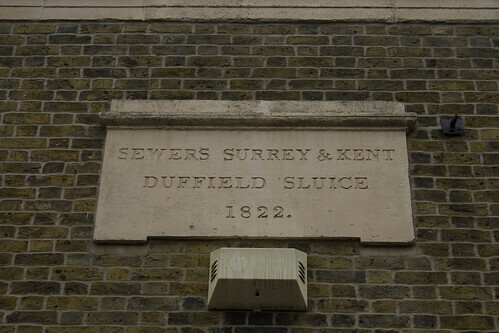 Duffield’s Sluice was constructed from the Lock Stream, which was part of the more famous Neckinger river, of which the associated slums inspired Charles Dickens’ Oliver Twist. The history of the sewage plant next to the office seems irritatingly difficult to track down, although there are drawings of it – if anyone has a copy of The Civil Engineer and Machinist by Charles Blunt lying around? 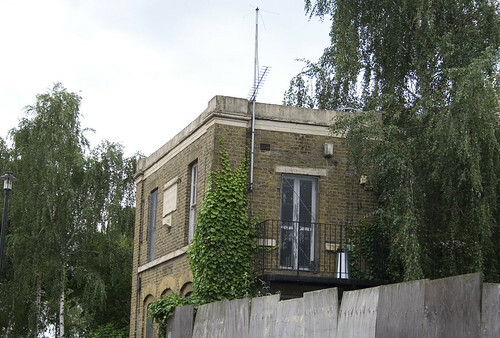 The remaining building is Grade II listed, and was passed to from Metropolitan Board of Works through the nationalised water companies to Thames Water – and was then sold in 1992 to a person who, it seems owns a cargo container business. Indeed, the back of the plot, which is a bit of a wasteland area is being used to store some containers at the moment. The building itself (map link) is a bit odd as it looks abandoned, with wire fencing on the windows and security warning signs, but the door looks clean and the street number (different from its listing address) is new. Interestingly, the Land Registry documents for the sale indicate that the sewers remain under the building, and are still used by Thames Water – which is probably why the building hasn’t been replaced with a block of flats by now. Making an educated guess, the land surrounding the building, was the sewer plant and is now housing. Certainly the Land Registry documents cite a single plot of land with a single owner surrounding the office building, and in pink on the image below, is the area which is has covenants restricting building works due to the sewers underneath. Those covenants date to 1917, which I presume is when the land was cleared. After passing through a number of owners, it was finally transferred to Southwark Council by the London Docklands Development Corporation (LDDC) in 1994. Now, there is 1980s blocks of flats on the land of the former sewage pumping plant, and the old office is all that is left of that pre-Victorian industrial memory – and something to point out to friends when out for a riverside walk and impress with your knowledge of history. Great piece of research. Just goes to show the extraordinary amount of local history in London still waiting to be uncovered. Good work. You continue to impress. You must have enough for a book by now. Things change. In the last couple of weeks the containers have been cleared out and scaffolding has gone up. I think we are going to be treated to another block of flats! A planning application was approved recently.